Acrylic display graphics are frequently referred to as optically clear, face mounting, or second surface mounting applications. These graphics require the use of an optically clear mounting adhesive. Optically clear mounting adhesives offer a completely transparent appearance that won’t diminish the look of the graphic behind glass, acrylic, or other clear substrates. 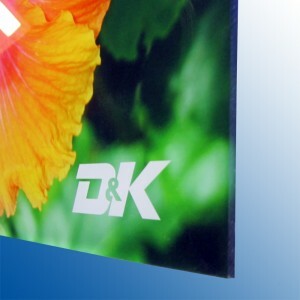 D&K optically clear mounting adhesives also feature UV inhibitors to help protect against graphic fading caused by the sun or overhead lighting. Acrylic displays or face mounted graphics offer an extremely modern and high-end look. Acrylic/face mounted graphics are sophisticated applications that require advanced mounting techniques. Click below to view a video demonstrating how to create acrylic face mounted graphics. D&K recommends using Expression® Optically Clear Removable (OCR) Mounting Adhesives for acrylic and other face mounting applications. The removable adhesive will remain firmly in place on acrylic, lenticular lens, and other optically clear substrates until intentionally removed. Utilizing this removable adhesive allows graphic shops to reuse expensive substrates if wrinkling, misalignment, or other defects occur in the mounting process.